Midland is a city in the American state of Texas. It is called Midland, because it is the midway point between two bigger cities in Texas, Fort Worth and El Paso. Oil was discovered in the region in 1923 and is still a larger part of the economy. 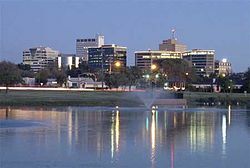 Midland is also famous as the hometown of former First Lady Barbara Walker Bush. She and her husband, former president George H. W. Bush lived there, with their children including the later US President George W. Bush and his wife Laura, and his brother Jeb Bush, the former Governor of Florida. ↑ 1.0 1.1 "Mayor & City Council". City of Midland, Texas. Retrieved January 29, 2018. ↑ "City Management". City of Midland, Texas. Retrieved January 29, 2018. Wikimedia Commons has media related to Midland, Texas. This page was last changed on 30 January 2019, at 18:38.